Every time I read this gospel story, the first thing that pops into my head is one of those colored plastic bands people use on their wrists. I’m sure you have seem the one I’m talking about, it has only 4 letters: WWJD which stand for “What Would Jesus Do”. In fact this has become so popular that I have seem the same 4 letters in car stickers, t-shirts and even screen-savers. I think that today’s Gospel is particularly important for Christians because, like a friend told me once, it is a good reminder that sometimes doing what Jesus would do might involve wiping some people around, spilling their money on the ground and flipping some tables like a crazy person. Ok... Maybe that’s taking it a bit too far, but today’s Gospel reading is important because it helps us dispel the erroneous image we have developed in our culture of a meek, passive, and submissive Lord. There will be time on Good Friday to be meek and submissive, a time in which the Lord is fulfilling the will of The Father, and gaining the eternal salvation of the world; but Today...today we see Jesus the man, doing what good men do: taking a stand. Not just pointing at an evil, but doing something about it. 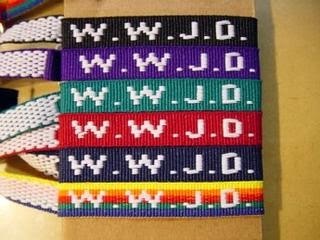 I have to confess I never liked these WWJD merchandise, basically because I feel they are used as an excuse to remind Christians that in all situations we are supposed to project peaceful almost angelic image and in all circumstances we should strive for harmony and never do anything to upset the sensibilities of anyone by doing things like speaking the truth and admonishing sinners. Now if we were to look deeper as to where this idea of a passive and meek Christian comes from we would have to admit that in fact this image is very attractive, to us. Why? because it is human nature to try to make everyone like us; and what a better way to do this than not upsetting anyone? The problem is that we transfer this image of a passive Christian into an image of a passive savior and in a sense we are making our Lord look just like us and not us look like him. The image of our Lord in today’s Gospel, becomes very upsetting when we realize that in certain circumstances in life we are to behave like this… when the moment calls for it we have to take a stance for what is right. Now in the season of Lent we are supposed to use our time to correct those things that need to be fixed in ourselves so that we can enter more fully into the mystery of Good Friday and the Joy of Easter Sunday. I would venture to say that one of the things we need to consider is our own personal image, quite simply lent is a good time to ask: Do I reflect Christ in me or do I make Christ a reflection of myself? Of course this type of self reflection is not easy, most times is very painful to look at our own shortcomings when it comes to imitating the master, so during lent the church gives us many opportunities to examine ourselves against the standard which our Lord. We have things like prayers, fasting and giving alms, which the Ash Wednesday Liturgy reminded us of how to do the right way. Then we have Stations of the Cross in which we see Jesus embracing his destiny and not shying away from the suffering he had to endure for the salvation of the world. And every Wednesday night in all the Churches of the Archdiocese of Baltimore, the light is on for us. Which is the campaign we have every year to encourage Catholics to take advantage of the Sacrament of Reconciliation. Now it is a sad reality for our Church that many Catholics hardly ever take advantage of this sacrament. Perhaps is because they are afraid, or perhaps it is because they feel that they have no sins to confess, or perhaps it is just because the feel it is not important, but the reality is that if we want to abandon this image of of a meek and passive Lord, the best way to start is by participating frequently of this Sacrament because it forces us to take a look at the ugliness of our personal sins. I am convinced my brothers and sisters that if Catholics were to take advantage of this wonderful gift of God’s mercy more frequently, especially men which are to be the spiritual leaders of their families, to put it simply, we would change the image the world has of all of us.